The AutoQuad has one dedicated interface available for connecting a receiver with a serial connection like the Spektrum satellites and Futaba S-Bus, Graupner HOTT SUMD, Multiplex M-Link and PPM sum. PPM uses a PWM connector (M14 by default). Be sure to also check out general Radio Setup page. Warning: Always power your transmitter first before you power your receiver! 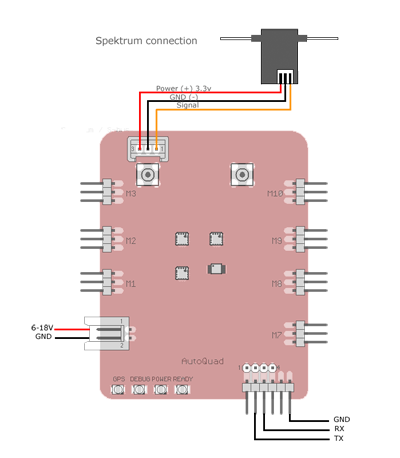 One Spektrum (or compatible) satellite can be directly attached to the AutoQuad. The standard Spektrum cable is to be used, but to be complete, a diagram of the connection is shown. If more range or diversity is needed, a satellite diversity board can be purchased to attach more satellites. At the time of writing, the binding is not yet possible from within the firmware so a bind must be made with a full Spektrum receiver and the satellite attached. If you use a Spektrum diversity board, binding can be done with the switch on the diversity board. 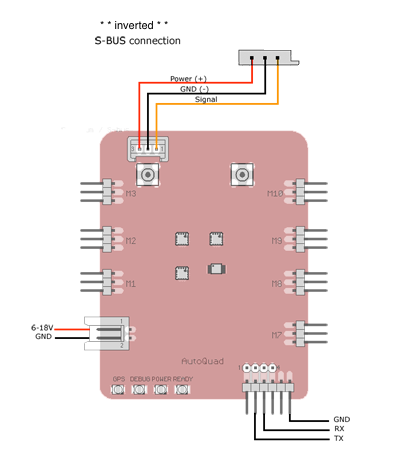 One S-bus receiver (or compatible) can be directly attached to the AutoQuad. As with most flightcontrollers, you need to invert the signal from the S-bus. There are a number of s-bus inverters for sale on various shops ($15). It is possible to modify some S.Bus receivers to output a non-inverted signal. See this link for FrSky X4R instructions. 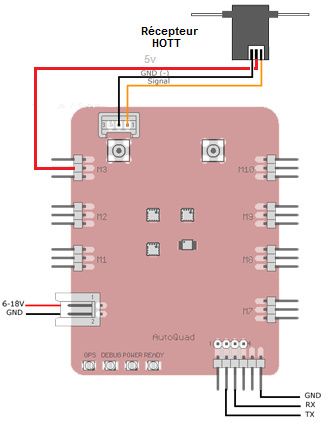 AutoQuad receiver connector but from a 5V line on the board. You can use any 5V output from the motor/pwm connectors, as shown in the 2nd diagram below. PPM support is included in AQ experimental firmware v6.6 r22 and up. If your receiver supports PPM output, or can be converted to provide it, then that output can be used directly. In other cases, a PPM converter/encoder can be used between any standard Rx and AQ. Always use the M14 connector for PPM input. The white arrow marks the signal pin for the PPM input signal. You can draw 5v power from the middle pin, and the other outer pin is ground. Note: If you’re facing drop outs on the throttle channel (sudden motor glitches), power your receiver and converter via external BEC instead of powering it via the FC or ESC. 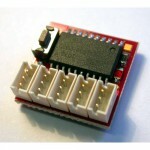 More details about using Groupner SUMD receivers can be found on this page. Here is a connection diagram to get you started.